Getting Over It with Bennett Foddy comes from that type of game developer who desperately needs you to think he’s smart and aware. The game takes a classic challenge (climbing a mountain), makes it ironically difficult (you play as a guy in a pot who can only use a hammer to swing and push himself to new platforms), and taunts players with patronizing songs like “Poor Me Blues” and “Whoops a Doodle” when they lose progress. Foddy himself speaks to you along the way. He opens with some talk about the “intensity” of starting over, such as having to redo one’s homework after accidentally deleting it, to prepare you for the ordeal he has created. “Feel free to go away and come back. I’ll be here,” Foddy says. Here, Foddy pretends that he and Jazzuo know something intimate about climbing. It seems Foddy has never known the pleasure of, say, climbing a tree as a child, which can be challenging without being frustrating. The frustration of these games is that they transform climbing into something that is strange at best and idiotic at worst. With that quote, Foddy romanticizes the past and denies part of the present. Has he ever watched the Angry Video Game Nerd, a satirical YouTube sensation that represents the rage of many youngsters who threw their controllers during the 1980s and 1990s? And has he seen the influence of Dark Souls in modern gaming? Foddy’s lack of historical credibility recalls Davey Wreden’s insufferable commentary in 2015’s The Beginner’s Guide. Wreden, Foddy, and others (like David OReilly and Toby Fox) represent a wave of smart-assed artists whose contempt for the status quo leads them to create games that would be better off as show-and-tell projects in game-design class. If there’s anything the indie gaming world needs to get over, it’s these guys. At times you are told to press a button to “think” in David OReilly’s Everything. This command serves as a way for OReilly to smirk at video-game shorthand and offer trite existential dialogue (“Am I really controlling this?”). More ironically, the command is OReilly’s attempt to turn off the player’s brain, as anyone who doesn’t need to be told to think might see that this game, like Mountain, is an unfunny, unintelligent joke. The premise of Everything is you can play as anything: animals, trees, rocks, grass, planets, and so forth. But you start off playing as one thing — in my case, a donkey. The donkey, like other animals, doesn’t walk as you might expect; it rolls thanks to extremely choppy animation with humorous intentions. So you roll to marked places in the world to talk to other things and learn new functions of the game, such as the ability to get similar things (in my case, other donkeys) to roll with you as sort of an absurd army. Along the way you unlock audio logs of philosopher Alan Watts, whose academic tone clashes with the idiotic sight of rolling donkeys and the game’s many silly and inconsequential lines, such as when a tree says, “I wouldn’t mind a nice jacket, though.” The tonal mismatch becomes even more embarrassing when you hear the pensive violins of the soundtrack. If you actually listen to Watts’ words about all things being connected (it’s always tempting to turn off the audio logs), you might consider the notion that Watts watered down Buddhist concepts for pretentious westerners. At the very least, OReilly’s goofy vision, where anything from deer to rocks can procreate by dancing in a circle, muddies the contributions of the scholar. That everything in Everything seems to come with kindergarten humor suggests OReilly is hoping Watts can give some depth to an oversimplified portrayal of existence. The closest Everything gets to genuine insight is how you can see the world from a different perspective depending on what thing, from gigantic to microscopic, you are. Perspective is not just about spatial differences, however. It’s also about different states and patterns of being. Thus, OReilly confirms his lazy intellectualism and design with the fact that animals in Everything travel and multiply in the same way that rocks do (was Watts ever this stupidly literal?). Everything could use the more distinct vantage points of Ryan Thorlakson’s Light’s End, which allows the player to assume the role of any person in the story, as in one memorable sequence where you, as a beggar, experience the prejudice of nonplayable characters. But like his condescending peers Davey Wreden and Toby Fox, OReilly knows it’s easier to create and sell whimsy than wisdom, so the superficial philosophy of Everything seems predestined. Mountain has received a lot of attention and analysis due to the perception that it isn’t like other games. This hype underlines “mountain simulator” strangeness and only represents a half-truth. Like many video games, Mountain immodestly asks for hours and hours of the player’s time. Without that time, you might not “get it,” you might not properly enjoy it, you might miss something. In contrast, Temporality, a recent game by James Earl Cox III, takes a few minutes to play, and there’s nothing “to get” besides the game’s reflection on the complementary joy and fragility of human existence. Mountain tends to inspire a mixture of irrelevant reactions. Some describe Mountain as a screensaver, others speculate about the meaning of a polygonal mountain getting struck by random objects after hours and hours, and still others, like Jim Sterling, refuse to criticize the game seriously. The positive/negative hype and guesswork surrounding the game serve no purpose. My review of Mountain also fails to put the game in a meaningful historical context (though I hold that the grandeur of real mountains trumps Mountain’s smart-assed messages). Mountain breaks the mold of video games not by subverting its conventions through inactivity, but by offering an entirely different kind of roleplay action as its subject. It presents neither the role of the mountain, nor the role of you the player-as-master, nor the absence of either role. In their place, Mountain invites you to experience the chasm between your own subjectivity and the unfathomable experience of something else, something whose “experience” is so unfamiliar as to be unimaginable. What is a mountain, exactly? It is a stand-in for the intractability of ever understanding what it’s like to be something else. Mountain offers a video game version of a philosophical practice I call alien phenomenology—a sustained and deliberate invitation to speculate on what it’s like to be a thing. Like Mountain, Temporality doesn’t have the expected things of video games like talking, collecting, shooting, managing, buying, selling, investigating, sneaking, jumping … the list of traditional game actions goes on and on. Instead, Cox uses a combination of music, pixels, and time manipulation to inspire consideration of a soldier’s sacrifice. Temporality only offers two actions for the player: the ability to move time forward and the ability to move time backward. If the player doesn’t hold down a key to perform either action, the game freezes allowing one to contemplate the gravity of life and death as defined by time and memory. As you move events forward or in reverse in Temporality, the game depicts life as a series of parallel occurrences in time. Cox’s intention isn’t to show a soldier at death’s door having flashbacks to happier, less dangerous experiences. The game avoids this banality through a cyclical presentation of pivotal moments in the soldier’s life, suggesting that our experiences move together and play off each other, like the individual instruments of a song. Cox’s intellectual understanding of life and time is not forced; it gives the game an emotional, universal power that is amplified by Jon Hopkins’ song “Immunity” (the affecting piano in “Immunity” exposes Mountain’s insulting offering of keyboard notes to the player). Temporality displays unique beauty that encourages interpretation, whereas OReilly’s floating mountains look like jokes compared to the awe-inspiring landscapes in Brothers: A Tale of Sons (Mountain’s zooming and spinning are backhanded features, not perspectives). 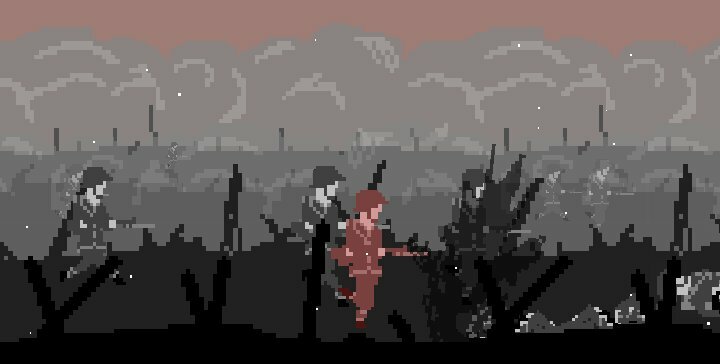 While Cox uses primitive pixels in Temporality, the game’s side-scrolling soldiers recall the tracking shots in Kubrick’s Paths of Glory and Spielberg’s Saving Private Ryan — not as homage but to establish definable emotional stakes. The game’s limited use of color heightens the stakes when the soldier, as a young boy, runs in a bright blue rain. Cox’s child-like appreciation of the past is genuine. For hours upon hours, you can let Mountain hang in the background of your computer activities. Perhaps the game chimes to signal another (hopefully) revealing message about “what it’s like to be a thing,” or maybe the whole thing is trivial fun. In any case, many point out Mountain only costs $1. So what? Temporality, free, has an indisputable statement to make and doesn’t need text to do it. Mountain is time wasted. Temporality is time considered.